In January 2017, Seattle City Light will continue supporting Advanced Metering services throughout the utility’s service territory by replacing existing utility poles with taller poles, which will host wireless utility data collection equipment. The new poles will be 70 feet tall, which is about 20 feet taller than the existing poles. 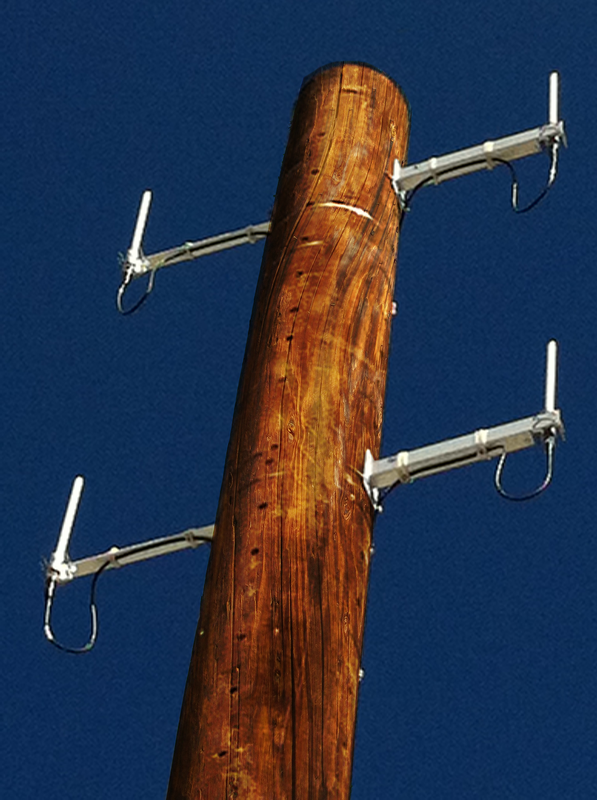 Rendering of wireless utility data equipment on a utility pole. This project is part of the communications network to support Advanced Metering, which will automate meter reading and enable enhanced services. View the January 2017 Utility Pole Upgrade maps for approximate construction work areas. More maps will be added on the Utility Pole Upgrade website as the project progresses into other areas within City Light’s service territory. There are no maintenance power outages planned for this work. Some traffic and parking impacts are expected in the immediate work areas. Crews will be careful to maintain access to driveways. Daily work hours are from Monday to Friday, 8:30 a.m. to 4:30 p.m. In most instances, the work to transfer existing equipment and install the data collection equipment can be completed in one day. Customers can contact JoAnna Perley, Advanced Metering Deployment Manager at (206) 733-9648 or JoAnna.Perley@seattle.gov. Seattle City Light will be holding a community meeting in the High Point neighborhood on Monday, March 18 to discuss plans to upgrade the streetlight electrical grounding system. The project is scheduled to begin in late March and will enhance streetlight safety by reducing the risk of contact voltage through improved grounding. Grounding systems are installed on street lights and other electrical systems to ensure safety for the public and anyone who may come in contact with elements of the system. Contact voltage can occur on the surface of metal streetlight structures, street signs, or other equipment that can conduct electricity and become energized. No contact voltage problems have been found at High Point during the past two years of inspections. Testing is completed annually by Seattle City Light to make sure all electrical equipment is safe. Streetlights at High Point were installed appropriately according to the codes in place at the time. Since then, improved grounding techniques have been established. This project will update streetlight grounding to current standards to enhance safety. There is a possibility of power interruptions during the day in order for the contractor to complete their work safely. Customers will be notified of upcoming outages at least 48 hours prior to any power outage. The project will take approximately ten weeks to complete. Work hours are 8:30 a.m.-4:30p.m. Monday through Friday. There will be minor traffic and parking disruptions, but flaggers will be used on residential streets to direct traffic. Crews are careful to maintain access to driveways. A community meeting is scheduled in the Neighborhood House at the High PointCenter on Monday, March 18 from 6:30 – 7:30 p.m. to discuss the project. There will be opportunities to ask questions and discuss concerns. Please join us in the discussion about what to expect. You can learn more about this project at http://www.seattle.gov/light/aboutus/construction/ . Seattle City Light has agreed to contracts with two companies that will assist with inspections and tests of the utility’s metal streetlight poles and groundcover plates. Davey Resources Group will begin testing and inspecting metal streetlight poles and groundcover plates starting Monday, Dec. 27. Davey will cover the territory from Denny Way north to the boundary of City Light’s service territory. Power Survey Co. (PSC) will begin testing and inspecting metal streetlight poles and groundcover plates starting Monday, Dec. 27. PSC will cover City Light territory south of Denny Way to the southern service territory boundary. City Light crews will team with the testing contractors to respond to any instances of contact voltage that may be found. The pole and/or groundcover will be de-energized and repaired on the spot, if possible. If more extensive repairs are required, the equipment will remain de-energized until repairs can be completed. Testing progress and results will be posted as information is reported. In an effort to do everything we can to ensure public safety, City Light is inspecting all 20,000 metal streetlight poles and 10,000 groundcover plates in its service territory, following the death of a dog that stepped on an energized ground plate in Queen Anne last month. An investigation by the utility determined that a pinched wire and improper grounding caused the hazard. Reports from residents helped to identify five other streetlights that carried voltage — three in Capitol Hill/Central District, one in High Point and one in Greenwood. City Light completed inspections on all metal streetlight poles and ground cover plates at Seattle Housing Authority locations, including High Point, GreenBridge, New Holly and Rainier Vista. No other voltage readings were found. A repair crew restored power about 1:15 a.m. to the 1980 homes and businesses in South Seattle and part of unincorporated King County that had been affected by a power outage since about 12:20 a.m. The cause of the outage was a cable failure. The general boundaries of the outage were SW Brandon Street on the north, SW 106th Street on the south, SW 10th Avenue on the east and SW 21st Avenue on the west. A Seattle City Light repair crew was responding to a power outage affecting about 1980 homes and businesses in South Seattle and part of unincorporated King County early Tuesday morning. The cause of the outage, which started about 12:20 a.m., was not immediately known. The crew expected to have power restored about 4 a.m. The general boundaried of the outage were SW Brandon Street on the north, SW 106th Street on the south, 10th Avenue S on the east and 21st Avenue SW on the west.